Here is a new app that I’ve been coding in Visual Basic 2005 Express Edition. Pretty much just a party app that DJ’s for you. Check it out and enjoy. -Download this from the Official Power Hour Download page. –Please report any other bugs/problems in the comments section. Feature requests are welcome! overall you have the main bugs down. 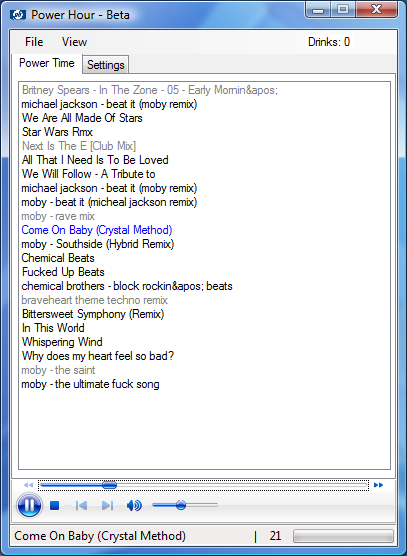 I would look into letting it “feed” off of windows media player or itunes or something. I would also look into having some kind of counter telling you how much time is left. Thanks for the suggestions kevin! What exactly do you mean by letting it feed off of windows media player? 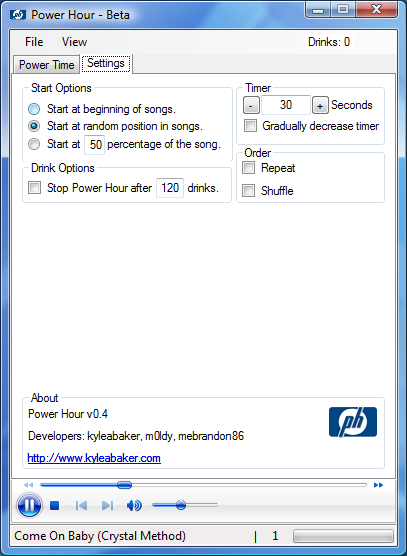 Power Hour is currently using Windows Media Player as the engine behind the music. I will see what I can do about the time remaining counter. Thanks! Thanks for liking the player though! Previous Previous post: Back to school..